Using data to take a closer look at how has the Arctic changed over the past 20 years and its corresponding impacts on industrial networks. In the past few months, higher temperatures in the Arctic Circle unveiled a new avenue this winter: the Bering Strait. The narrow corridor between Alaska and Russian Siberia offers the only marine gateway between the icy Arctic and the Pacific Ocean. As a result, the passageway offers a plethora of opportunities and risks for commercial shipping and marine wildlife alike. This week, the Planet OS Data Integration team will explore the primary factors that have driven the decline of sea ice in the Bering Strait and the potential impacts of these patterns on Arctic industries. To make sense of the vast quantities of data on climatic trends in the Bering Strait, Planet OS Data Integration Engineer Eneli Toodu has developed a number of visualizations using climate and geospatial data. Inspired in part by an article by Forbes Magazine, we wanted to use our API to numerically examine the extent of environmental change in the Arctic. This visualization provides context for the recent and rapid loss of ice in the Bering Strait earlier this month. No ice dissolution in the last decade has occurred to the extent observed this winter. Additionally, March is an atypically early time of year for ice melt in the Bering Strait. Among the factors that could be driving this rapid transition, rising temperature stands out as a key component. The relationship between temperature and sea ice is incredibly complex. While higher temperatures cause increased ice melt, they also contribute to increased precipitation and alterations in ocean currents. Additionally, the duration and seasonality of temperature change impact the fluctuation of ice levels as well. Thus, to further examine this relationship, the Planet OS Data Integration team analyzed decades-worth of temperature and sea ice data in the Arctic. The graph paints a clear picture of the major climate trends for the cross-continental passageway. Overall, average annual temperatures have been increasing since 1980. In particular, the annual temperatures of the past six years rose notably. Since 2013, the average yearly temperatures have been above the 48-year average. In 2018, the average temperature was nearly 3 degrees Celsius hotter than the 48-year average, marking the highest temperature recorded in the area for the past 50 years. As seen above, even the hottest yearly temperature in our dataset is below the freezing point of water. While annual temperatures give insight into the trends around temperature change, they do not point to the primary cause of sea ice melt (which is the number of days in a year where the average temperature exceeds 10 degrees Celsius.) Instead, this measurement provides insight into the amount of time that sea ice would be exposed to higher temperatures, thereby affecting its melting rate. This next graph reveals another integral variable that contributes to the ice decline in the Bering Strait. The graph illustrates the number of days each year in which mean temperatures were greater than 10 degrees Celsius. The past three years, in particular, have had a greater frequency of atypically hot days. Through a comparison of this graph with the sea ice visualization above, it becomes increasingly clear how recent changes in climate have significantly impacted the presence of ice in the Bearing Strait. While many ecologies are dependent on ice in the Bering Strait for survival, the increasing width of the passageway provides new opportunities for Arctic companies. Two primary northern industries: shipping and resource extraction, often depend on clear, liquid seas for their operations. In the capital expenditure demanding industries of oil extraction and global container shipping, projects are typically planned seasons or even years in advance. Therefore, the margin of error is minimal and knowledge of the fluctuating climatic states is essential. 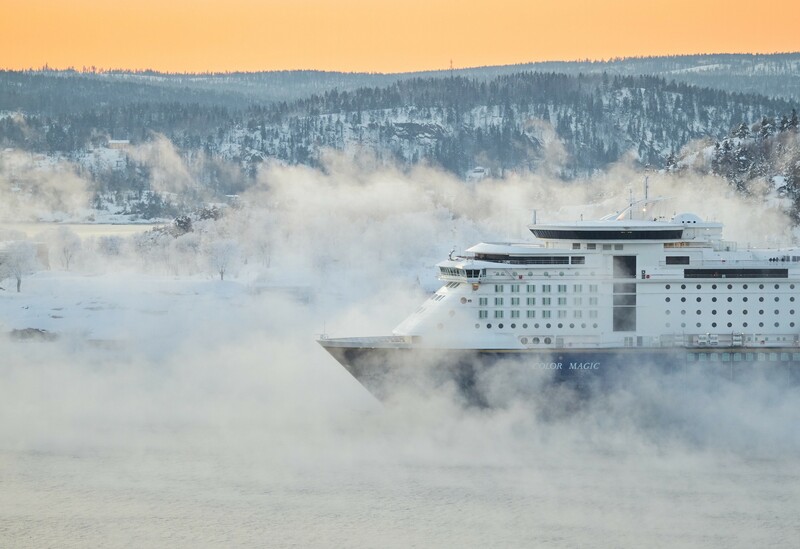 As the process of seasonal sea ice melt begins earlier and earlier each year, transportation and oil extraction businesses can operate with greater safety. An ice-free Bearing Strait promises greater consistency and security in their return on investment. However, these opportunities carry heavy risks. While ice coverage has, by and large, declined, fluctuations in climate can be frequent and drastic. On a good day, unexpected ice formations could block shipping routes and disrupt drilling operations. On a bad day, unspotted icebergs can wreck oil rigs and capsize container ships. When these accidents do strike, they also can wreak havoc on marine ecosystems. An oil spill in the Bering Strait, for example, could cull fish stocks and threaten endangered rare whale species. To harmonize polar industries and ecosystems, a data-driven approach to oceanic development is critical. Through analyzing oceanic trends, risk departments can prevent dangerous events and improve their response preparedness. Planet OS has the capabilities to equip logistics officers, geologists, and environmental impact specialists with the tools to seamlessly analyze thousands of climatic and oceanic variables. We are excited to provide a platform for users and industries alike to utilize the seemingly endless flows of data to decrease risk, increase opportunity, and to protect Earth’s integral ecosystems. 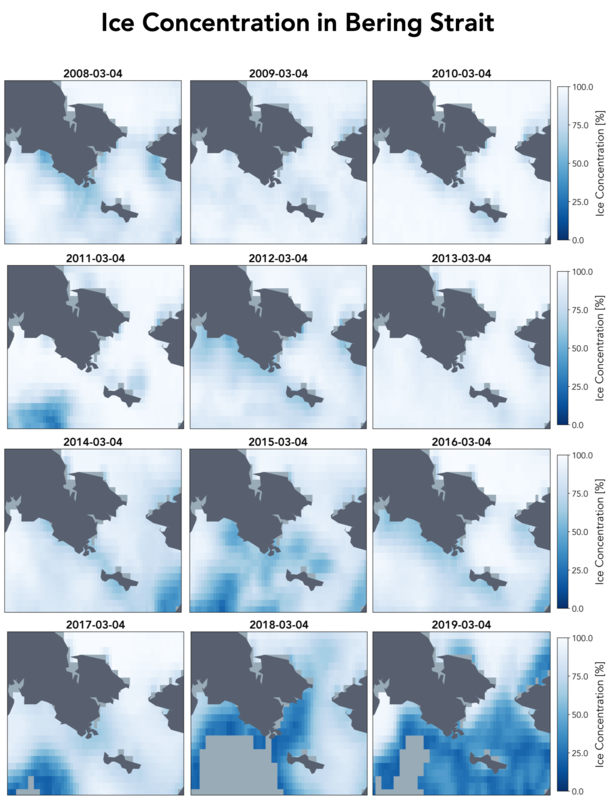 To apply Datahub’s available datasets towards informative and applicable tools, click here to access our Github notebook that provides a step by step guide on creating your own active Arctic sea ice and temperature visualizations. Many of the datasets made available through the Planet OS Datahub have been at the request of our users. For those who require a consolidated, easy to use, resource for accessing large and complex material that the Datahub does not already offer, please reach out to the team and we will work toward bringing it onboard. For more information check out the Planet OS Datahub.